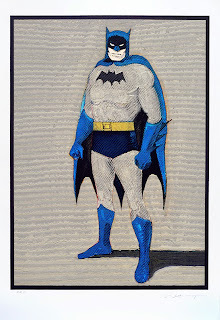 The response to Mel Ramos's Superman and Batman woodcut/acrylic editions has been tremendous! Revisiting some of his earliest Pop Art paintings and released only four months ago, Ramos's superhero prints proved to be especially popular with his European audience; only seven sets were acquired by American collectors, while the rest were speedily dispatched overseas. The Sacramento-born Ramos lives and works in Oakland, where he is equally well-loved: a Batman print donated to Flourish, an annual art auction held locally to benefit the Oakland Art Murmur organization, sold before auction at a price well over retail. Magnolia director Donald Farnsworth credits the artist's commitment to broadening the scope of his practice, as well as the innovative hybrid techniques perfected by the staff at Magnolia: "Having worked with Mel for twenty years," Farnsworth says, "he has been consistently fearless in diving in to tapestry, digital/analog print combinations, and the variety of mad science experiments he is presented with at Magnolia." Farnsworth also points to the unusual intersection of content and technique from multiple generations that coalesces in Superman and Batman. 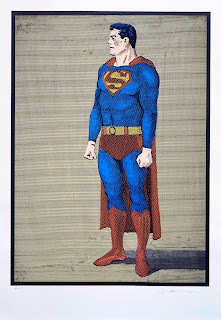 "In these prints," he explains, "we're using an Old World woodcut matrix – but the content is classic Pop Art, and the artist is using digital-age tools to manipulate the composition and direct the cutting of the wood block." 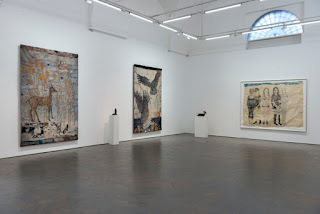 Judging from the extraordinary response to these editions, Ramos's heroes are still able to profoundly affect their audience more than half a century since Ramos decided to paint his favorite comic book characters in 1962 and Pop Art was born. “It is the most historically significant Pop Art painting in our permanent collection,” noted de Young Curator of American Art Timothy Burgard in this excellent 2012 magazine profile of Ramos. Besides signaling the beginning of Pop Art, Ramos's early superheroes also marked an important transition in the artist's subject matter. 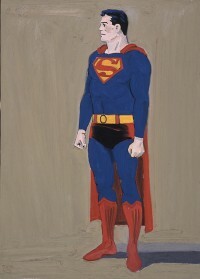 Once the de Kooning-inspired abstractions of his art school days gave way to the unambiguous figuration of Superman and Batman, it was only a matter of time (less than a year, in fact -- cf. 1962's Phantom Lady and Wonder Woman) before Ramos began painting superheroines, which ultimately led to the colorful female nudes for which he is best known. Accordingly, the artist is currently working on a new set of woodcut editions that will revisit the superheroines of his Pop Art past. Stay tuned to this blog for details, or sign up for the Magnolia Editions mailing list.